We talked in Part 3 of this series about organizing the visible structure of your site. Good structure makes it easy for a visitor to find what he is looking for. But is there anything on the site worth looking for? Does it tell the visitor what he wants to know? Is there any news? Are you providing any unique or unusual ideas? Is the copy clear? Does it describe why someone should do business with you? Does it tell some people that they should not do business with you, like people who want plastic stamped parts, when you make metal stampings? Good content is as important on your site as it is in your ads, in your news releases and at your IWCS booth. Once you have figured out your content, here are some tips for arranging it on your site. Split up the pages. For a reader, this simplifies the site and makes it easier to understand. Fewer copy points on a page are easier to take in Splitting up pages also allows you to play with more URLs, titles and H1 tags. Have a prominent mailing and/or shipping address and your phone number on all your pages. Like visitors to the site, Google respects this transparency—you are not anonymous. You may be worried that a prospective customer will shy away from a source not in his backyard. He might, but he might shy even further away if he thinks you don't have a real address or if he thinks he will never get follow-up support. This brings us to what your content should not contain. Most important, it should not use black hat techniques. Like everyone else, you have undoubtedly received an email from someone who "happened to see your site and can make it rank much higher" with the search engines. This is very possibly someone using black hat techniques. These techniques include keyword stuffing, duplicate content, installing content that is the same color as the background, and using multiple gateway pages, each page designed to meet the preferences of a certain search engine. Sometimes these techniques are temporarily beneficial, but they will come back to haunt you. Google is not a novice in hand-to-hand combat with the hacks. Perhaps one of the most egregious black hat techniques is using a link farm. Every day, a company somewhere with a high search engine ranking neglects to renew its registration and loses the name of its site, which is then bought by a link farm agent. The agent may operate his own link farm or may sell the site to others who run link farms. In either case the link farm's proposition is made to you, and to thousands of others, to buy backlinks from that high-ranking site, for say, US$100 (they don't tell you all this, but this is what they are doing). The backlinks show up on these high-ranking sites every time they are visited. You pay the US$100, the link farm puts up backlinks to your site and Google increases your ranking because it sees all your new visitors. Google however, is not dumb and eventually sees your backlink, along with hundreds of others, on a page totally unrelated to your business. It finds the link farm and stops spidering its sites, effectively putting it out of business. There goes your US$100. Something else happens, too. You are an accomplice and your site is showing false popularity. The search engine will dramatically downgrade your site's ranking and may even blacklist it. This doesn't happen every time, but do you want to chance it? 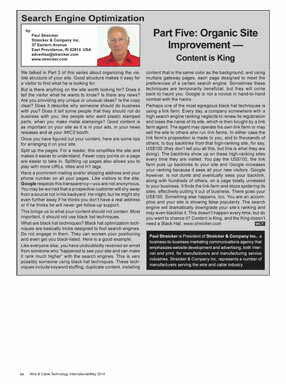 Content is King, and the King doesn't need a Black Hat. This is the fifth in a series of articles being published bi-mothly in Wire & Cable Technology. Part one is here. Part two is here. Part three is here. Part four is here.